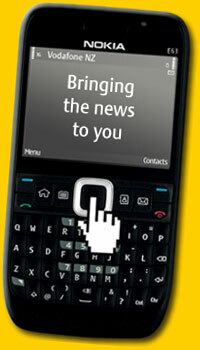 Enjoy the convenience of having news sent straight to your mobile. We have a variety of alerts available so you can choose which ones you receive, from headlines twice a day to breaking news sent to you as it happens. TXT Alerts cost only 25c each (per TXT message sent). When news breaks, you will be the first to know with a single TXT. Get the top headline from your favourite section, whether it be National news, World, Business, Technology, Sport, Entertainment news. Bringing you the news you want, direct to your mobile twice a day. ReplyTXT 'STOP' to the TXT alert to unsubscribe at any time. SMS charges apply to the subscription TXT. Once signed up you will be charged 25 cents per alert, each time an alert is received. TXT alerts are for Vodafone mobiles only. Coverage is required to receive the alert. If you are out of coverage when the alert is sent to your mobile the TXT will try to re-deliver to your mobile over the next 3-5 hours, but will terminate if it does not get through and your account will not be charged for that message. If you are on global roaming, overseas international GPRS rates may apply. You can easily cancel your subscription before you go overseas by sending a ReplyTXT 'STOP' to the alert, and you can re-subscribe on your return by going to Vodafone live! (if you have a Vodafone live!-capable handset) or by using the keyword sign-up codes as above. Standard data rates apply to use the internet on your mobile. If you click on a link within the TXT alert you will be charged standard data rates to access that mobile web page. Click here for more info on mobile internet.